Towering 235m (770 ft.) above the Danube, Gellért Hill offers the city’s best panorama on a clear day (bus: 27 from Móricz Zsigmond körtér). It’s named after the Italian Bishop Gellért, who assisted Hungary’s first Christian king, Stephen I, in converting the Magyars. Gellért became a martyr, according to legend, when vengeful pagans, outraged at the forced and violent nature of Stephen’s proselytism, rolled Gellért in a nail-studded barrel to his death from the side of the hill. An enormous statue now stands on the hill to celebrate his history. 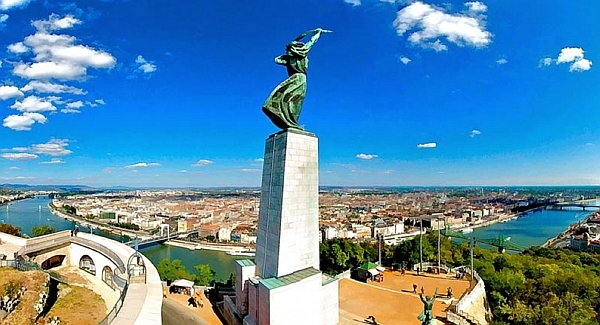 On top of Gellért Hill, you’ll find the Liberation Monument, built in 1947 to commemorate the Red Army’s liberation of Budapest from Nazi occupation. The 14m (45-ft.) statue of the woman holding the palm leaf of victory is visible from just about any viewpoint along the river. To her sides are statues representing progress and destruction. Following the first election in 1990, there was much discussion as to whether the statue should be removed since the Soviet troops were more of an occupation rather than liberation. Also atop the hill is the Citadella, built by the Austrians shortly after they crushed the Hungarian uprising of 1848 to 1849. Views of the city from both vistas are excellent, but the Citadella is spectacular. Don’t bother paying the extra to traipse up to the upper part; the view is not that much higher, so don’t waste your money.